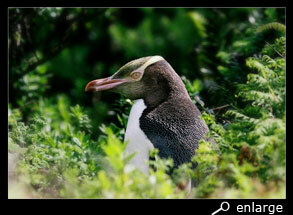 - This genus has only one species: the yellow-eyed penguin. 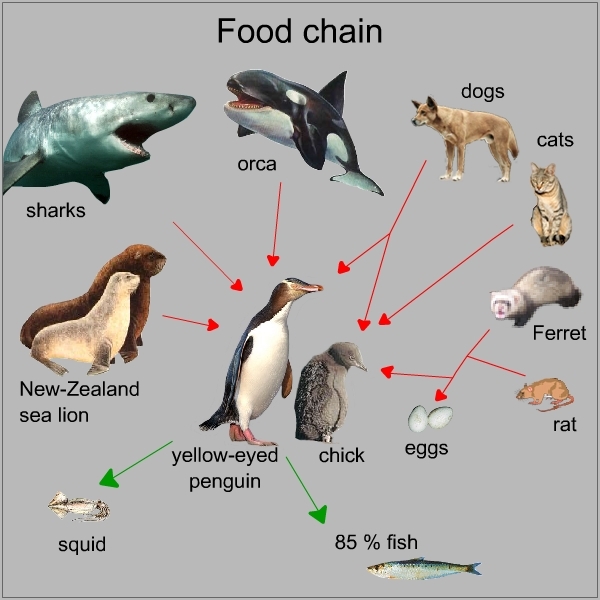 This 18-year continuing study is still known as the first and very important penguin research. 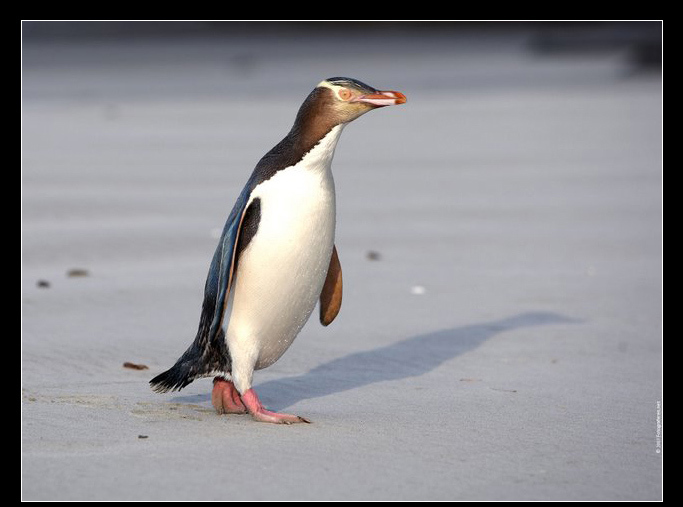 - The species belongs to the warm sea penguins, meaning they live in moderate oceans. 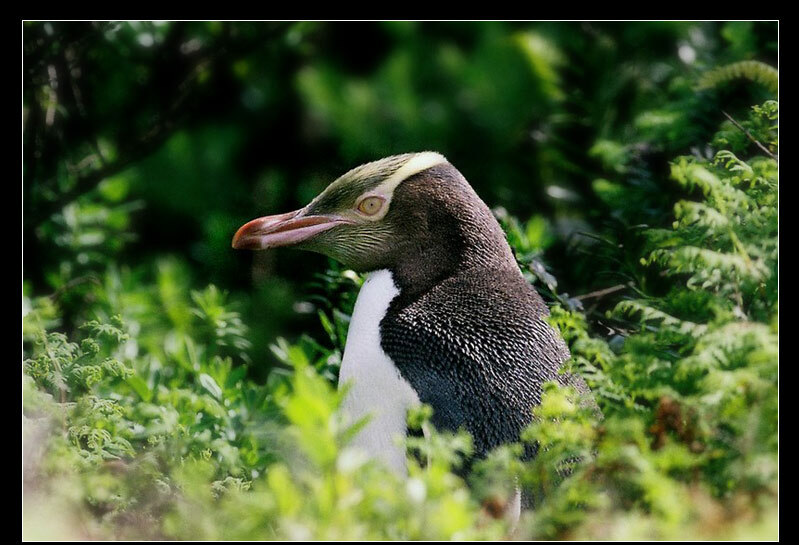 They suppose yellow-eyed penguins look the best like the original penguins. They have a broad yellow band, starting at the bill, round the eyes, and broaden over the top of their head. The back is blueish black and the head slightly more brown, with yellow black cheek and top. They have yellow eyes, therefore their name. Chcicks are uniform brown and the juveniles look a lot like the adults, but their face is more whitish and they lack the yellow band. At the time they are 1 year, they will become more and more yellow. Lifespan is about 23 years. 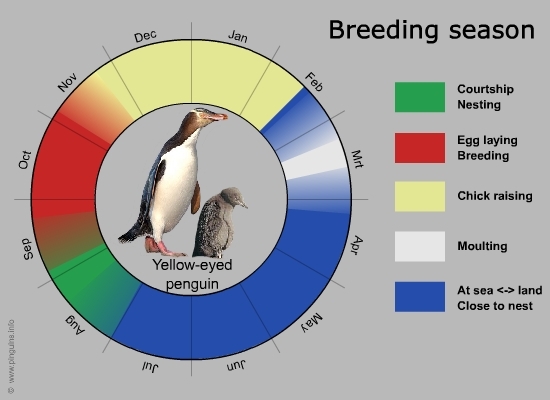 The yellow-eyed penguin was first described by Hombron and Jacquinot in 1841, who used thescientific name "Catarrhactes antipodes". 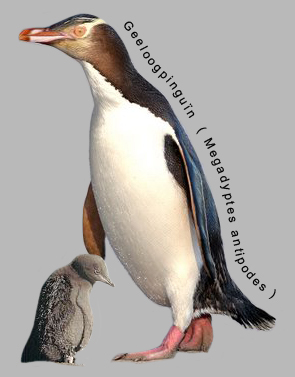 The Latin name "Megadyptes antipodes" means "large diver of the antipoden". 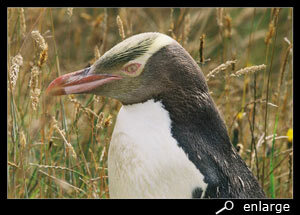 The Maori call the yellow-eyed penguin "Hoiho" or "Tavora" or "Takaraka"(older). In Dutch rarely the name "gluuroogpinguïn or antipoden pinguïn" is used. Yellow-eyed penguins are around 55 à 65 cm tall. Their weight varies during the year, being the highest (7 till 8 kg) just before moulting and the lowest (5 till 6 kg) after moulting. Pretty normal, considering they can't eat during moulting, which lasts 3 weeks. Therefore they stuff up with food, before starting. 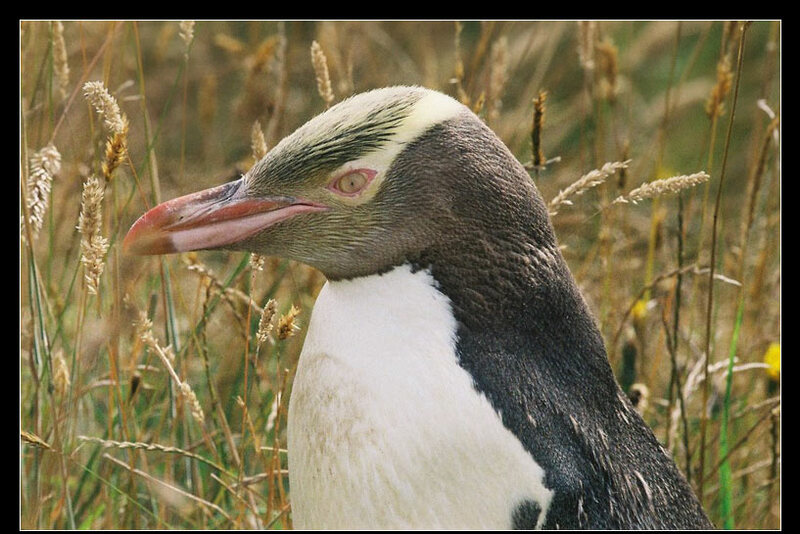 Yellow-eyed penguins breed on the east coast of the South Island in New Zealand, on Stewart Island and on sub Antarctic islands southern of New Zealand, especially at Enderby Island of the Auckland islands and on Campbell Islands. Most of the breeding places are situated on private property or in reserves, so as tourist you need permission or a guide to visit them. The total breeding population is estimated at 1500 pairs. While this number is so low, they are strongly guarded by animal protectors. Nests are not underground, but made between the bushes, flax or grass with the help of twigs, grass and vegetation. They breed solitary and are very shy, keeping out of sight for each other. Nests are at far distance and on the beach they rarely meet each other too. They are sedentary birds; meaning they stay close to the nest all year long. Many pairs stay together all their lives, even when they are not breeding. In August, sometimes new pairs are formed at the old nesting ground of one of the partners. Two eggs are laid in September-October, and they both will hatchmost of the time. Incubation time lasts 39 till 51 days, with both parents alternate in shifts of 1 à 2 days. After around 20 days, the thicker down will replace the old, thinner one, and now they will start exploring the area around the nest. The first 6 weeks after hatching, one parent will stay at the nest and guard the chick, while the other one will forage and brings food. Later on both parents will forage and the chick remains alone at the nest. Seldom crèches are formed. Chciks moult to their juvenile plumage in mid February and leave the nest (fledge) at the end of February when they are around 106 à 108 days old. After 3 or 4 year they will start breeding themselves, being sexually mature, and often form bonds for life. The adult birds moult in March, after the breeding season, and some time at sea to forage and regain energy. During winter the birds are less shy to each other and larger groups of birds will meet up on the beach. Then new pairs will be formed and they have time to court. 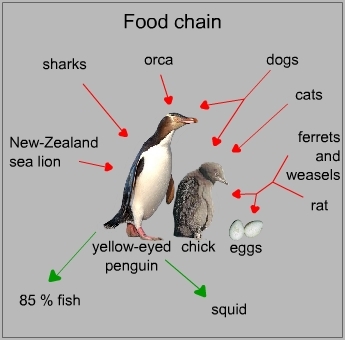 Yellow-eyed penguins mainly eat small (20-300 mm) fish, complemented with some squid. They rarely go far away from the nest and mostly forage in a range of 15 km out of the coast. Although they can reach a depth till 50 m, they mostly go fishing close to the water surface. In the water they are killed by sharks and sea lions. A leopard seal or orca will do so too, but that is rather seldom. On the mainland they suffer a lot from introduced mammals like cats and dogs. Mustelids (ferrets, weasels, ...) and rats will rob eggs and small chicks from the nest. Destruction (clearing) of the forests on the coast and grazing cattle have a very negative influence on their population number too. And on remote islands, the birds have to suffer of the commercial overfishery, stealing their food.